You probably know that this Saturday’s Made in Maui County Festival will have lots of shopping from Maui’s finest artisans spread out all over the Maui Arts and Cultural Center, but did you know they will have a food truck party, too? The inaugural Made in Maui County Festival is a big deal. The county took a hint from the hugely successful Made in Hawaii Festival held annually in August at the Blaisdell in Honolulu. It’s attended by 35,000 people and has featured many Maui vendors who fly over to participate and sell their goods. The version here is co-presented by the County of Maui, the Mayor’s Office of Economic Development and the Maui Chamber of Commerce. Originally, the organizers set their sights on about a hundred participants, but more than 150 applications from local businesses–all willing to shell out $150 to $335 for exhibition space–pushed the number up to 130. There will be vendors all over the property. Participants had to have their business based in Maui County, but also their products had to adhere to the state law for the use of “Made in Hawaii” monikers, which means at least 51 percent of their value was added in Hawaii. Organizers also considered creativity, product mix and quality. The event will have a lineup of speakers and demonstrators on the MainStage that has me salivating. The entire morning lineup consists of food demonstrations like making a Pohole Salad with Hana herbs and flowers, MauiGrown Coffee, Life Foods Italian food, Okonomiyaki with Chef Kyle Kawakami of Maui Fresh Streatery and almond milk chai by Joy’s Place. Maui’s fashion gets highlighted in a fashion show and there will be a demonstration on making your own tees. Maui Homeopathy will have a presentation and local authors Jill Engledow, Tom Peek and Wayne Moniz will do book signing and readings. Last up, mixologist Gave Harvey will show off the locally inspired Mill Camp Mojito. Then there’s the hip food truck lineup. They start at 8 am and go till 5pm (just like everyone else) and the flavors will run from sweet to savory. I will have no problem forking out the $3 entry fee to eat there all day. There’s Dibs on da Ribs. Their rib plate and ginger garlic chicken come with banana cornbread, salad and rice, and they serve a kalua pig and pork sausage fried rice. Donut Dynamite has five fully loaded brioch donut flavors, and fry-to-order mini donuts. Like Poke always sells our of their fresh poke (ono, ahi and salmon). But they also have fried poke, katsu, kalua pig and shooters. I’ve also been waiting to try Milagros’ food truck menu–they will have black bean nachos, carne asada quesadilla, guacamole, salsa and chips, crab cake sandwiches and fresh fish done their way. 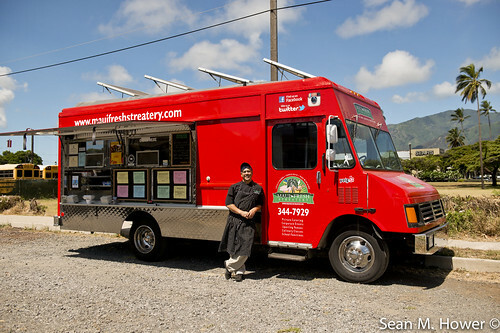 Three’s Bar and Grill food truck will have their ono licious and irritable Hurricane Fries, but also a mac nut chicken with papaya salsa, hamburger steak, bacon-wrapped dog with chutney and kim chee and Caesar. Sumo Dogs Maui combines fruit flavors like guava, mango and lilikoi to make Maui’s most unique hot dog combinations in their amazing buns. They will also bring the shave ice. The festival takes place this Saturday. They expect close to 8,000 attendees. 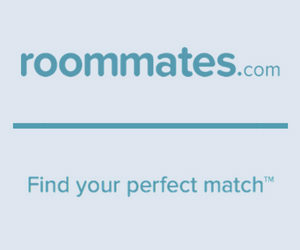 For more information, visit MadeInMauiCountyFestival.com. The social media savvy can follow or post to #MIMCF2014 on Twitter, Instagram and Pinterest. Public admission is $3, children 12 and under are free. Hawaiian Shave Ice with a variety of local favorite flavors such as li-hing mui, mango, pineapple, blue vanilla, strawberry – also with additional topping such as Haupia (coconut) snowcap, sweet cream, or a scoop of vanilla ice cream. Do You Know Your Pohole? What Makes a “Sumo Dog”? A cold almond milk chai demonstration by joy’s place LIVE! Learn about the Benefits of Vog Off! and Smoke Off! On Veteran’s Day (Nov 11), Hospice Maui invites you to dine at one of the 35 restaurants spread across the island that are participating in their fifth annual Dine Out event. The restaurants, some new and some participating for the entire run, will donate a portion of their proceeds from sales that day to Hospice Maui. Celebrating on Veteran’s Day isn’t just a coincidence, either. It’s also our favorite time of year to indulge in Wailea. This Sunday through Saturday, Restaurant Week means it’s time to sample Wailea for seven days straight. The event started in May 2009 with 13 posh eateries, and now it has filled out to 21 participants. The folks at Wailea Resort Association do all the planning for this event, which has become very popular in its seven years of life. Costello also offers this tip for choosing 7 nights and 21 restaurants: check the wine pairings. Several of the restaurants offer pairings for an add-on. 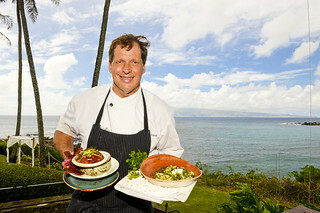 The event has become a destination time for visitors to come try the Wailea food landscape so check on reservations, too. For more info, go to Wailearesortassociation.com. Speaking of drinking wine in Wailea, tickets are on sale for the Hui No’eau’s annual Wailea Food and Wine Celebration held at Hotel Wailea next Friday. 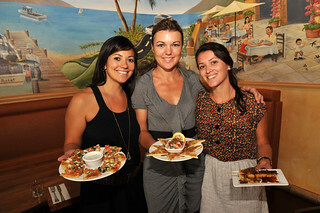 Schmooze over wine and art with some of Maui’s best chefs, who will present tasting plates for pairing. This fundraiser supports the Hui’s community arts education and shows like their delicious Mixed Plate, currently hanging for its last week at the Visual Arts Center. 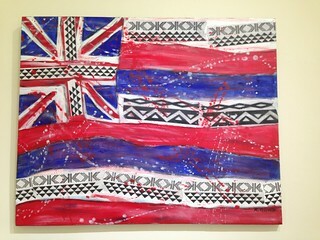 The themed exhibition celebrates island life with a truly diverse collection of 52 different works from 48 artists, chosen by juror Michael Takemoto, a Baldwin High School grad and Assistant Professor of Art at the University of Hawaii Maui College. The idea was born last year when Hui staff met with Maui archeologist Dr. Janet Six and discussions led to slippahs, red hot dogs and other cultural idiosyncrasies. The artists were asked to visually explore our island’s unique cultural influences in food, humor, environment and traditions, through mixed media pieces in this fine art hanging. For more info, visit Huinoeau.com or call 808-572-6560.